Since this tutorial will fly over many different aspects, make sure to also have a look at the other tutorials, mainly the tutorial about building a simulation model. First of all, freshly start V-REP. The simulator displays a default scene. We will start with the body of BubbleRob. We add a primitive sphere of diameter 0.2 to the scene with [Menu bar --> Add --> Primitive shape --> Sphere]. We adjust the X-size item to 0.2, then click OK. The created sphere will appear in the visibility layer 1 by default, and be dynamic and respondable (since we kept the item Create dynamic and respondable shape enabled). This means that BubbleRob's body will be falling and able to react to collisions with other respondable shapes (i.e. simulated by the physics engine). We can see this is the shape dynamics properties: items Body is respondable and Body is dynamic are enabled. We start the simulation (via the toolbar button, or by pressing <control-space> in the scene window), and copy-and-paste the created sphere (with [Menu bar --> Edit --> Copy selected objects] then [Menu bar --> Edit -> Paste buffer], or with <control-c> then <control-v>): the two spheres will react to collision and roll away. We stop the simulation: the duplicated sphere will automatically be removed. This default behaviour can be modified in the simulation dialog. We also want the BubbleRob's body to by usable by the other calculation modules (e.g. the minimum distance calculation module). For that reason, we enable Collidable, Measurable, Renderable and Detectable in the object common properties for that shape, if not already enabled. If we wanted, we could now also change the visual appearance of our sphere in the shape properties. Now we open the position dialog on the translation tab, select the sphere representing BubbleRob's body, and enter 0.02 for Along Z. We make sure that the Relative to-item is set to World. Then we click Translate selection. This translates all selected objects by 2 cm along the absolute Z-axis, and effectively lifted our sphere a little bit. In the scene hierarchy, we double-click the sphere's name, so that we can edit its name. We enter bubbleRob and press enter. Next we will add a proximity sensor so that BubbleRob knows when it is approaching obstacles: we select [Menu bar --> Add --> Proximity sensor --> Cone type]. In the orientation dialog on the orientation tab, we enter 90 for Around Y and for Around Z, then click Rotate selection. In the position dialog, on the position tab, we enter 0.1 for X-coord. and 0.12 for Z-coord. The proximity sensor is now correctly positioned relative to BubbleRob's body. We double-click the proximity sensor's icon in the scene hierarchy to open its properties dialog. We click Show volume parameter to open the proximity sensor volume dialog. We adjust items Offset to 0.005, Angle to 30 and Range to 0.15. Then, in the proximity sensor properties, we click Show detection parameters. This opens the proximity sensor detection parameter dialog. We uncheck item Don't allow detections if distance smaller than then close that dialog again. In the scene hierarchy, we double-click the proximity sensor's name, so that we can edit its name. We enter bubbleRob_sensingNose and press enter. Next we will take care of BubbleRob's wheels. We create a new scene with [Menu bar --> File --> New scene]. It is often very convenient to work across several scenes, in order to visualize and work only on specific elements. We add a pure primitive cylinder with dimensions (0.08,0.08,0.02). As for the body of BubbleRob, we enable Collidable, Measurable, Renderable and Detectable in the object common properties for that cylinder, if not already enabled. Then we set the cylinder's absolute position to (0.05,0.1,0.04) and its absolute orientation to (-90,0,0). We change the name to bubbleRob_leftWheel. We copy and paste the wheel, and set the absolute Y coordinate of the copy to -0.1. We rename the copy to bubbleRob_rightWheel. We select the two wheels, copy them, then switch back to scene 1, then paste the wheels. 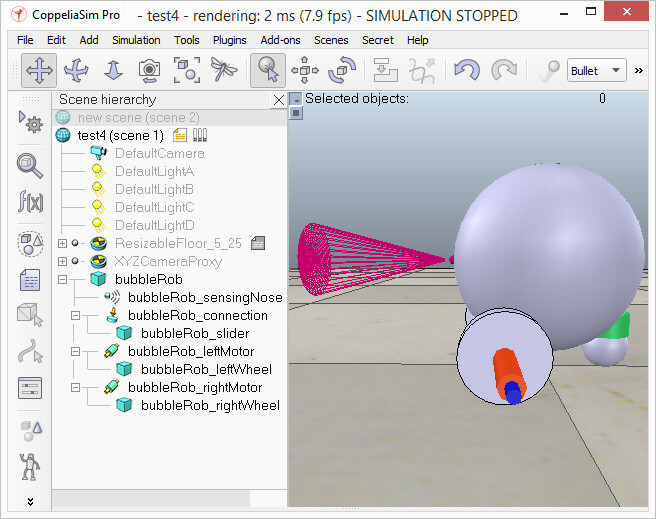 We run the simulation again and notice that BubbleRob slightly moves, even with locked motor. We also try to run the simulation with different physics engines: the result will be different. Stability of dynamic simulations is tightly linked to masses and inertias of the involved non-static shapes. For an explanation of this effect, make sure to carefully read this and that sections. We now try to correct for that undesired effect. We select the two wheels and the slider, and in the shape dynamics dialog we click three times M=M*2 (for selection). The effect is that all selected shapes will have their masses multiplied by 8. We do the same with the inertias of the 3 selected shapes, then run the simulation again: stability has improved. 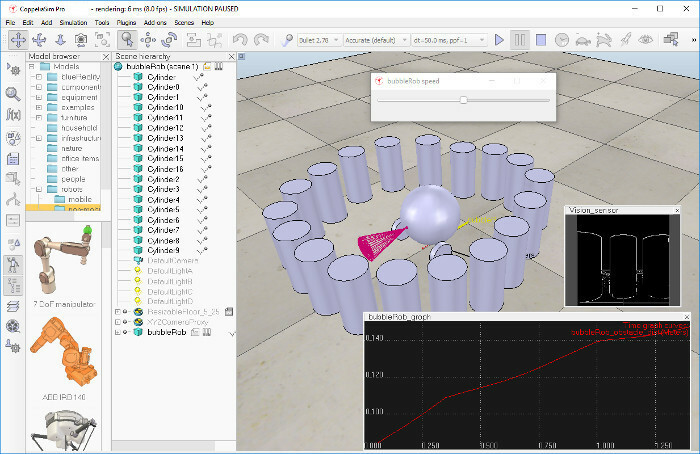 In the joint dynamics dialog, we set the Target velocity to 50 for both motors. 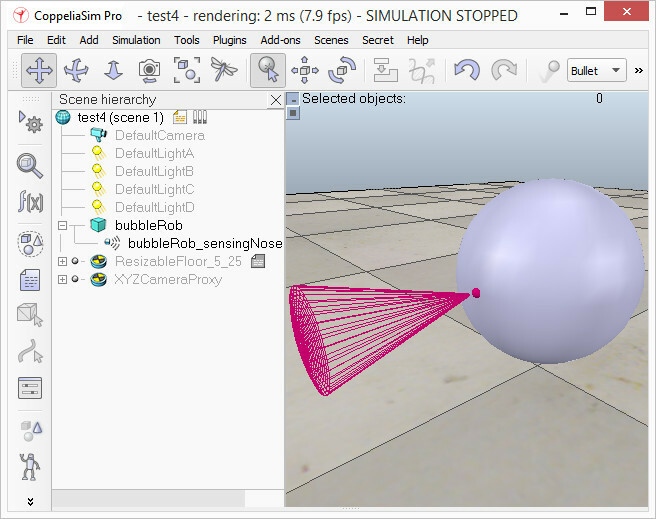 We run the simulation: BubbleRob now moves forward and eventually falls off the floor. We reset the Target velocity item to zero for both motors. In the collection dialog, we click Add new collection. A new collection object appears in the list just below. For now the newly added collection is still empty (not defined). While the new collection item is selected in the list, select bubbleRob in the scene hierarchy, and then click Add in the collection dialog. Our collection is now defined as containing all objects of the hierarchy tree starting at the bubbleRob object (the collection's composition is displayed in the Composing elements and attributes section). To edit the collection name, we double-click it, and rename it to bubbleRob_collection. We close the collection dialog. In the distance dialog, we click Add new distance object and select a distance pair: [collection] bubbleRob_collection - all other measurable objects in the scene. This just added a distance object that will measure the smallest distance between collection bubbleRob_collection (i.e. any measurable object in that collection) and any other measurable object in the scene. We rename the distance object to bubbleRob_distance with a double-click in its name. We close the distance dialog. When we now run the simulation, we won't see any difference, since the distance object will try to measure (and display) the smallest distance segment between BubbleRob and any other measurable object in the scene. The problem is that at this stage there is no other measurable object in the scene (the shape defining the floor has its measurable property turned off by default). At a later stage in this tutorial, we will add obstacles to our scene. Next we are going to add a graph object to BubbleRob in order to display above smallest distance, but also BubbleRob's trajectory over time. We click [Menu bar --> Add --> Graph] and rename it to bubbleRob_graph. We attach the graph to bubbleRob, and set the graph's absolute coordinates to (0,0,0.005). Now we open the graph properties dialog by double-clicking its icon in the scene hierarchy. We uncheck Display XYZ-planes, then click Add new data stream to record and select Object: absolute x-position for the Data stream type, and bubbleRob_graph for the Object / item to record. An item has appeared in the Data stream recording list. That item is a data stream of bubbleRob_graph's absolute x-coordinate (i.e. the bubbleRobGraph's object absolute x position will be recorded). Now we also want to record the y and z positions: we add those data streams in a similar way as above. We now have 3 data streams that represent BubbleRob's x-, y- and z-trajectories. We are going to add one more data stream so that we are able to track the minimum distance between our robot and its environment: we click Add new data stream to record and select Distance: segment length for the Data stream type, and bubbleRob_distance for the Object / item to record. In the Data stream recording list, we now rename Data to bubbleRob_x_pos, Data0 to bubbleRob_y_pos, Data1 to bubbleRob_z_pos, and Data2 to bubbleRob_obstacle_dist. We close all dialogs related to graphs. 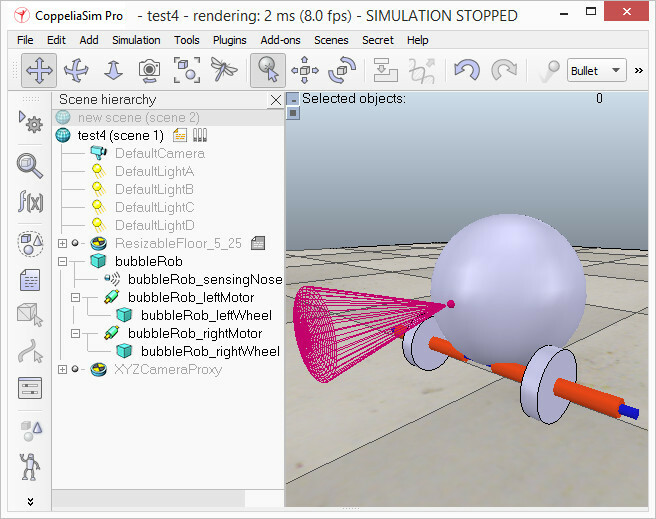 Now we set one motor target velocity to 50, run the simulation, and will see BubbleRob's trajectory displayed in the scene. We then stop the simulation and reset the motor target velocity to zero. We set a target velocity of 50 for the left motor and run the simulation: the graph view now displays the distance to the closest obstacle and the distance segment is visible in the scene too. We stop the simulation and reset the target velocity to zero. Next we will add a vision sensor, at the same position and orientation as BubbleRob's proximity sensor. We open the model hierarchy again, then click [Menu bar --> Add --> Vision sensor --> Perspective type], then attach the vision sensor to the proximity sensor, and set the local position and orientation of the vision sensor to (0,0,0). We also make sure the vision sensor is not not visible, not part of the model bounding box, and that if clicked, the model will be selected instead. In order to customize the vision sensor, we open its properties dialog. We set the Far clipping plane item to 1, and the Resolution x and Resolution y items to 256 and 256. We then open the vision sensor filter dialog by clicking Show filter dialog. We select the filter component Edge detection on work image and click Add filter. We position the newly added filter in second position (one position up, using the up button). We double-click the newly added filter component and adjust its Threshold item to 0.2, then click OK. We add a floating view to the scene, and over the newly added floating view, right-click [Popup menu --> View --> Associate view with selected vision sensor] (we make sure the vision sensor is selected during that process). To be able to see the vision sensor's image, we start the simulation, then stop it again. We run the simulation. BubbleRob now moves forward while trying to avoid obstacles (in a very basic fashion). While the simulation is still running, change BubbleRob's velocity, and copy/paste it a few times. Also try to scale a few of them while the simulation is still running. Be aware that the minimum distance calculation functionality might be heavily slowing down the simulation, depending on the environment. You can turn that functionality on and off in the distance dialog, by checking / unchecking the Enable all distance calculations item. Using a script to control a robot or model is only one way of doing. V-REP offers many different ways (also combined), have a look at the external controller tutorial.